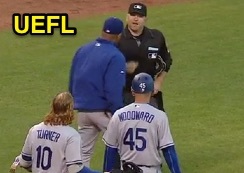 HP Umpire Mike Muchlinski ejected Dodgers 3B Justin Turner for arguing a strike three call in the top of the 8th inning of the Dodgers-Giants game. With two out and one on, Turner took a 1-2 sinker from Giants pitcher Cory Gearrin for a called third strike. Replays indicate the pitch was located over the outer half of home plate and thigh high (px .652, pz 2.566) and that all pitches during the at bat had been properly officiated (replays also indicate ESPN's live K-Zone graphic was, as it often is, improperly or inaccurately calibrated: px .652 should not show as the outside corner [px .7083 is the edge of home plate, see UEFL Rule 6-2-b-1 for the math]), the call was correct. At the time of the ejection, the Giants were leading, 2-1. The Giants ultimately won the contest, 2-1. This is Mike Muchlinski (76)'s first ejection of the 2016 MLB regular season. Mike Muchlinski now has 6 points in the UEFL Standings (2 Previous + 2 MLB + 2 Correct Call = 6). Crew Chief John Hirschbeck now has 13 points in Crew Division (12 Previous + 1 Call = 13). This is the 73rd ejection report of the 2016 regular season. This is the 37th player ejection of 2016. Prior to ejection, Turner was 0-4 (SO) in the contest. This is Los Angeles' 2nd ejection of 2016, T-1st in the NL West (ARI, COL, LAD, SD 2; SF 0). This is Justin Turner's first ejection since May 31, 2015 (Marty Foster; QOC = N [Balls/Strikes]). This is Mike Muchlinski's first ejection since September 7, 2015 (Melvin Upton, Jr; QOC = Y [Balls/Strikes]). Wrap: Los Angeles Dodgers vs. San Francisco Giants, 6/12/16 | Video available via "Read more"